For some fun in the sun you can’t go past our range of equipment of skating gear. Our aim is to provide you with the highest quality products and materials at the most affordable prices possible. We have a vast range of supplies including mini banana skateboards in a variety of colours and materials. With these exciting units built for fun and fitness, you and your friends will have endless amounts of fun hanging out and boarding together. Hit the roads and be seen with an old school style mini-unit that is now available in a range of different colours. Mini units are specially designed with great quality material to develop balance and coordination. Safe, durable, compact and easy to use these units are an amazing mode of transportation for anyone. 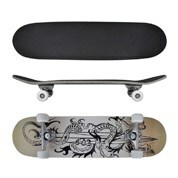 It's small deck and smooth PU wheels, makes transportation a breeze. A perfect toy to keep you fit and healthy all year round. Similarly to our other Games and Leisure equipment including Arcade Machines and Pool Toys that work to provide you with the perfect solution to your needs. We work hard to ensure we provide you with the best experience possible. We ship across Australia, including major cities like Sydney, Melbourne, Perth, Brisbane, Adelaide, Canberra, Newcastle and The Gold Coast. If you would like to learn more about any of our products in general, feel free to contact us through our online form or call our customer service centre at (03) 9998 6805.